LIMITED TIME & ONLY A FEW LEFT! PINE TREES ARE GORGEOUS YEAR ROUND AND THEIR FRUIT THE PINECONE IS ONE OF THE MOST POPULAR SHAPES USED FOR DECORATING. 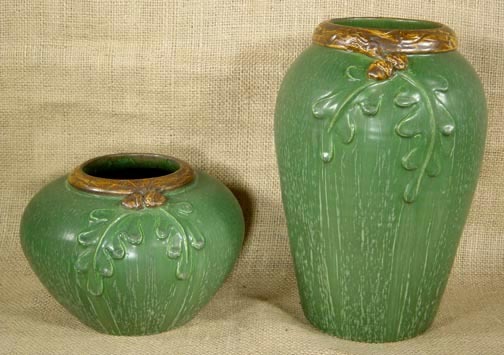 THESE VASES ARE REMINISCENT OF ARTS AND CRAFTS PERIOD POTTERY FROM GRUEBY AND TECO IN THE EARLY 1900S. 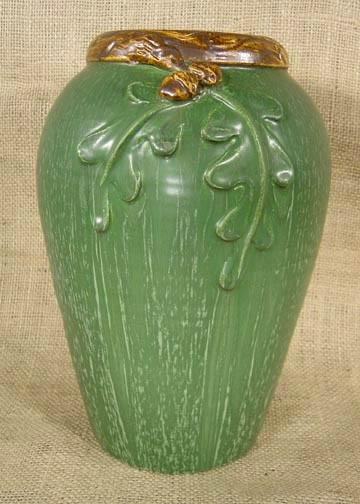 ONLY 500 VASES OR MUCH LESS ARE MADE BY EPHRAIM POTTERY OF EACH STYLE. VERY COLLECTIBLE. EXQUISITE DETAIL. 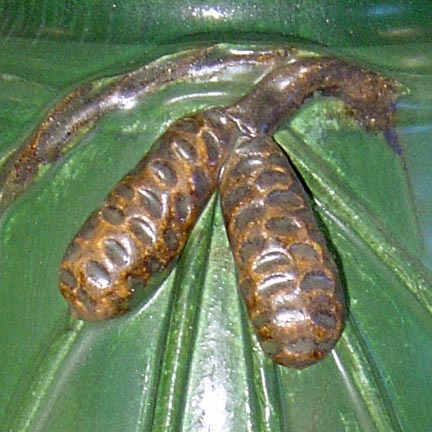 DISCONTINUED BY THE POTTERY COMPANY 1/06 AFTER REACHING APPROXIMATELY 500 MADE. YOU ARE LUCKY TO BE ABLE TO OBTAIN THE LAST ONE OF THE POTS BEFORE THEY ARE GONE. RETIRED 6/06 AFTER REACHING ONLY 68 MADE. LAST OPPORTUNITY! SHIPPING AND PACKAGING HAS GOTTEN EXPENSIVE!! Sorry the shipping and packaging has gotten so expensive. The USPS has raised their rates for shipping large packages tremendously. Where a package may weight only 6 pounds USPS charges as if it weights 23 pounds since the box is large. We insure and double box everything and add lots of bubblewrap and peanuts for padding since the USPS likes to use the packages as footballs! It all adds up unfortunately. 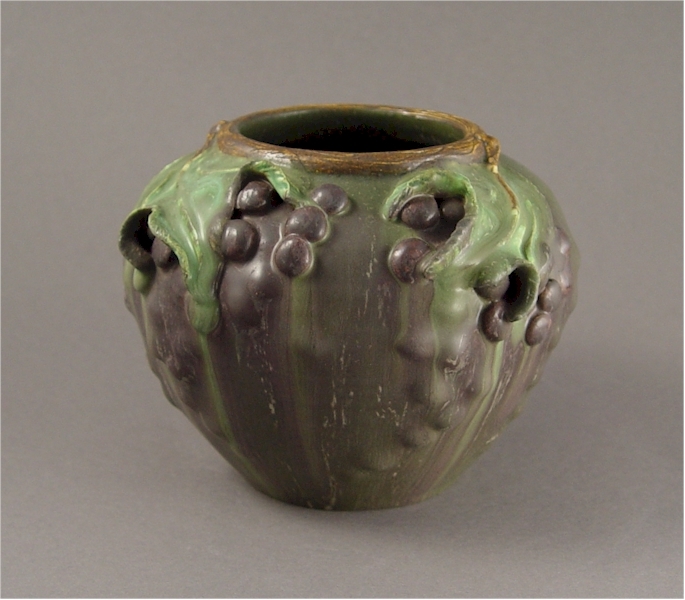 "Ephraim Faience pottery is thrown, sculpted, and glazed by hand. Each piece is an individual work of art. We do not slip-cast our pieces, so no two are exactly alike. The hand-made nature of our pottery contributes to its individuality and enhances its collectibility. 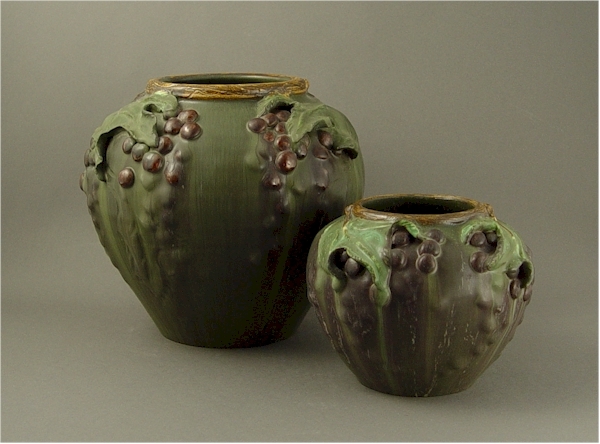 The foot of each piece bears the impressed mark of our studio and the signature of the potter or sculptor. Each of our designs is a limited edition of no more than 500 first-quality pieces. We usually introduce about 30 new pieces each year. In order to keep our work fresh and our artists sane, we try to retire about the same number of pieces each year. This means that most designs will be retired before their edition sells out. 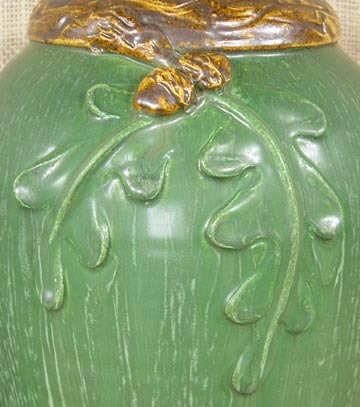 Ephraim Faience pottery is beautiful, affordable, and finely crafted. Our pieces are heirloom quality. 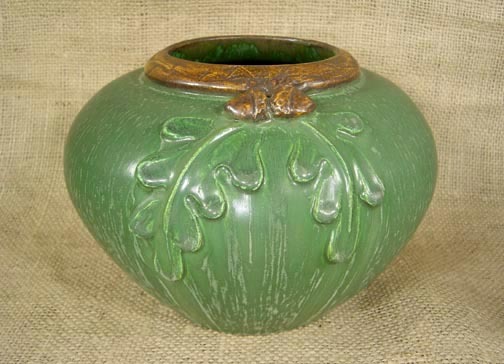 Whether you are decorating an Arts and Crafts home or just love fine art pottery, we hope you will consider adding some of our pieces to your collection. If you are a collector of old Arts and Crafts pottery, we invite you to experience how wonderful new art pottery can be when it’s made with respect for the old traditions." 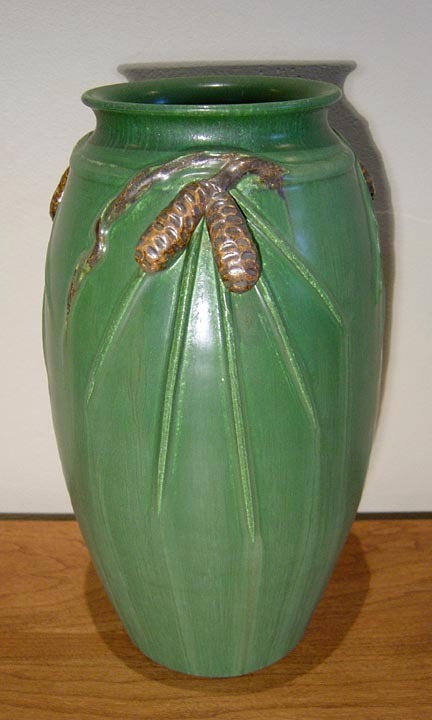 "Keeping your Ephraim pottery looking clean and new makes for a good impression and helps maximize its appeal. Here are a few tips to help you ensure that your pottery continues to look as new as it did the day you unpacked it. Our pottery should be dusted with a dry, soft cloth. It’s a good idea to remove any rings before handling the pottery, as they can leave marks that may be difficult to remove, especially on the lighter colors. Never use anything abrasive on EFP. To remove grime and scratches left by rings, try using a damp, light-colored sponge with a small amount of Soft Scrub® cleanser. Rub gently and remove any excess cleanser from the surface of the pot with a damp sponge or soft cloth. Never use anything oily or gummy on your EFP vases. Price stickers are likely to leave a gummy residue that will absorb into the pores of the glaze, resulting in permanent damage to the piece. Never use any oily product like Goo Gone® to attempt to remove gummy residue; it will only make the problem worse. If your store uses price stickers, it’s a good idea to put them on the bottom (foot) of the piece where there is less glaze and where any residue will not be visible. (A product that we have tested and found to work well for adhering price tags is called Glue Dots™. We have tested the “High Tack” version on both the glazed and unglazed surfaces of our pottery, and even after several months there was no residue visible. For more information, see http://www.gluedots.com. We have ordered this product from a company called BrownCor, http://www.browncor.com or 800-327-2278.) Last of all, please advise your customers to NEVER put water directly into an EFP vase! Our vases are porous and are not designed to hold water. The vase may leak or even crack, ruining it and whatever piece of furniture it is sitting on. If a customer is determined to display live flowers in an EFP vase, please advise them to put the water in a glass or plastic cup or test tube that is small enough to fit through the opening of the piece. You may wish to suggest displaying dried flowers as an alternative. Care information for our pottery is printed on the product cards that are included with your shipments. Please make sure you receive a product card, so you are aware of this important information. This will make sure that you gets the maximum enjoyment from your piece and that its beauty will last for generations to come." THE POTTERY IS BEAUTIFULLY HANDCRAFTED IN THE U.S.A.